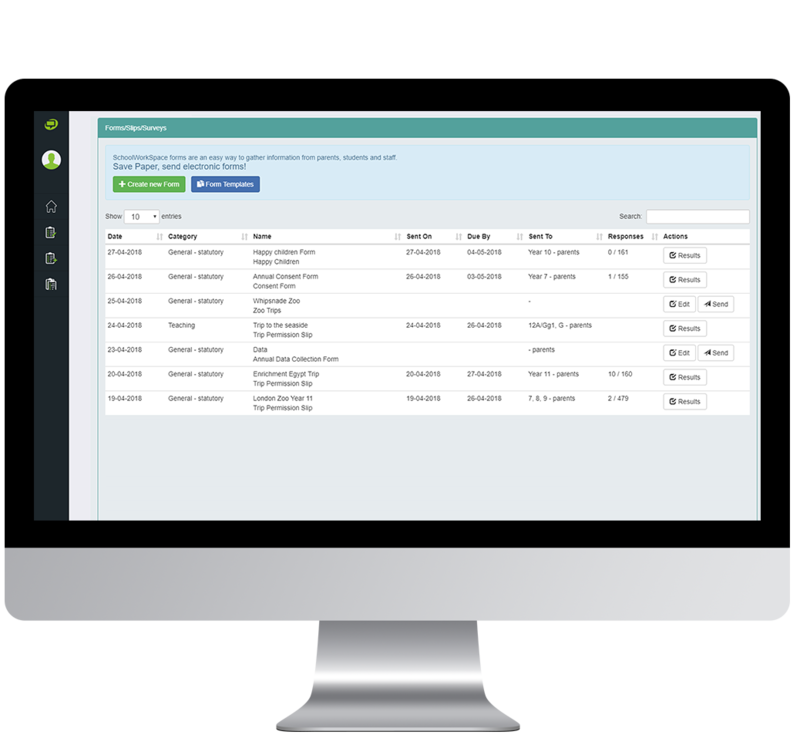 The Messenger Forms Dashboard displays a summary of both sent and draft forms. From your Forms Dashboard, you will be able to locate any form that you have created to continue working on draft forms or view the results of forms that have already been sent. 1) To begin, click on Forms under the Messenger Forms tile. 2) You will see a list of sent by the school, as well as your drafts, separated by columns with relevant information. Date form was sent to recipients. Blank field means the form hasn’t been sent yet (draft form). Not necessarily the date of an activity set out in the form, but rather the date that recipients need to respond by. Blank field means the form hasn’t been sent yet (draft form). The group (e.g. Year 7, 10A etc.) and the recipients, i.e. parents, students, staff. How many recipients have responded out of the total recipients. Blank field means the form hasn’t been sent yet (draft form). If you have already sent out a form to recipients, you will see the option to view Results from the Actions column. 1) Click Results next to the form you wish to view. 2) From the Responses page you will be able to see a list of all recipients, along with the responses of those that have already replied. 3) From the Actions button at the bottom of the page, you will be able to access additional functionality such as downloading responses as a spreadsheet, editing the form, or sending the form to additional recipients. 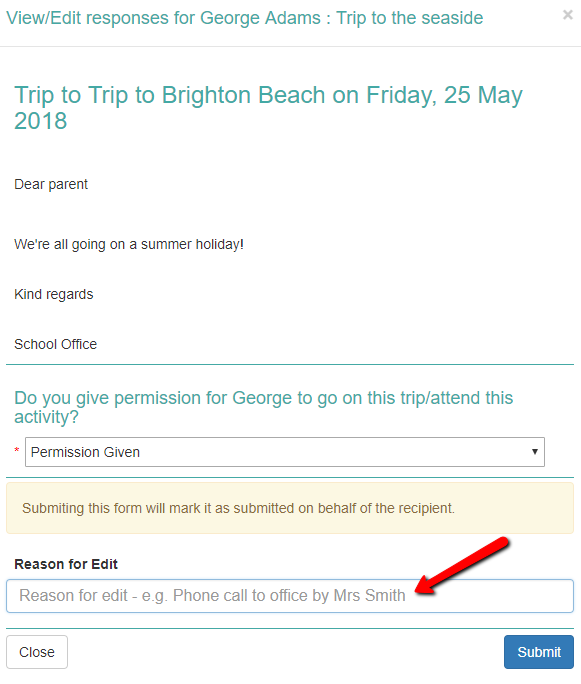 Top Tip: Clicking Edit Form from the Actions button will allow you to make changes to the form that will be visible to the existing recipients. Ensure any important changes made to the form are done so before the required due date that recipients need to respond by. You can edit recipients’ responses from the Responses page. This is useful for circumstances in which you have been provided with a response via another method of communication e.g. over the phone. It is also helpful if the recipient has informed you that they wish to change their initial response. It advisable to exercise caution when editing a response on behalf of the recipient and use as a last resort, where the recipient is unable to complete the form. 1) To change or add a note to a recipient’s response, click Edit next to the recipient you wish to update. 2) From the Edit pop-up box, update the response as needed and add a comment into the Reason for Edit This will ensure transparency between staff when using Messenger Forms. 3) Once you have updated the response, click Submit. 4) The Replied column will be updated to show your name (rather than the recipient’s) and the time it was updated. a. This will take you to the Edit Form page where you can continue working on it. b. If you are ready to send this form, click Save and Continue. From the next page, complete the Send Form page, then click Send Now. 2) If you are ready to send a previous created draft form, without making any further changes, click Send. a. 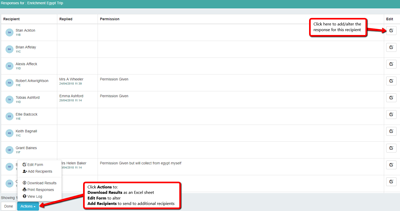 From the Send Form page, you will need to confirm the recipients for the form. When you are ready click Send Now.